Curtain rises for retailers seeking online sales. Coral Springs, Florida-based Shakespeare�s Cigar Corp. was launched in 2001 when Scott Shakespeare and his father, Robert �Shakey� Shakespeare - who at the age of 80-plus smokes six to eight cigars a day - decided over dinner to pursue what was for them, and still is, a labor of love. Since then, the company has evolved from a one store/one-product website (www.shakespearecigars.com) to a multi-vertical interactive marketing platform system that�s helping retailers fight back against Internet price busters. One of the most important aspects of the Shakespeare Internet marketing strategy is that the manufacturer�s suggested retail price will always be maintained on all Web sites. 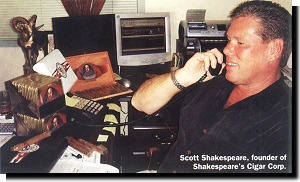 Scott, who serves as president and chief executive officer of Shakespeare�s, entered the cigar business after a pioneering career as an Internet entrepreneur. �The online discounters are only interested in pushing product at the lowest price possible. This can kill the [traditional] retailer,� he says. Helping retailers fight back with a basic Web presence may be the first step in this battle. �Cigars are a personal statement,� says Shakespeare. �Cigar smoking is a direct relationship between the cigar and the individual. Every cigar is an individual experience.� While many smokers would probably agree with this, the offer to purchase one�s favorite cigars over the Internet, usually at a discount when compared to a retailer�s price, can be very hard to resist. That�s what has motivated Shakespeare to launch his business and put his unique strategy, which combines tradition with technology, to the test. Retailers do not pay a fee for the Web presence provided by Shakespeare. They do, however, stock his exclusive brands in their stores and receive a percentage from the sales derived from the site attributed to them. Tobacconists carrying any of the Shakespeare brands qualify for a free web site design with their own �dot.com� name to match their �brick & mortar� store. All costs of running the site and fulfilling Internet orders are borne by Shakespeare. All the retailer has to do is promote his �dot.com� to his customers for which he earns a 20% commission without touching any product. �It�s perfect to offer to any transient customer traffic or even regulars that can�t always make it to the store,� says Shakespeare. One of the first retailers to sign on for his own web presence through Shakespeare�s is Treasures Within, a retailer in Geogia. They carry the Works of Shakespeare lines in their store and promote the web site designed for them at no charge, www.TreasuresWithinCigars.com. Retail stores that carry Shakespeare�s products are also given a free listing on the company site. Products are promoted via print ads, trade shows, word-of-mouth, and - of course - Internet marketing. But at Shakespeare�s it�s not all about technology. The company has been working hard with growers and manufacturers to develop new brands since it can promise ready distribution. It currently offers seven handmade premium cigar lines: Shakespeare Vintage, Shakespeare Signature, Cuban Classic, Grande Cigars, Navigator, Esteban Carrera, and Vigilante. The recently-released Shakespeare Vintage series is comprised of a five-leaf blend of aged tobaccos that delivers a smooth, richly-flavored but mild-bodied smoke. Vintage is offered with either a natural Connecticut shade or triple-fermented maduro wrapper. Torpedo and Churchill shapes are presented in 13- or 25-count cedar boxes ($68.00 to $168.50 retail) as well as 5-pack samplers, while a Petite Corona is packed in eight-count tins ($22 each retail). According to Shakespeare, sales have been �brisk� although actual figures for the company are not disclosed. Shakespeare�s Classic line is a light-bodied smoke made with a blend of Nicaraguan and Honduran long filler, a Jalapa Valley-grown Nicaraguan binder, and finished with an Ecuadorian Connecticut shade wrapper. Robusto, Churchill, and Torpedo shapes are offered, packed in 13- or 25-count cedar boxes ($58.50 to $125 retail) or 5-pack samplers. The Cuban Classic line is a solid medium to medium-full bodied cigar, made from a blend of Nicaraguan and Honduran sun-grown long filler leaf featuring an Ecuadorian binder and two very distinct wrappers, a Nicaraguan Habano and Maduro. Churchill, Torpedo, Toro, and Robusto shapes are offered, either in straight-side parejo or box-pressed versions and are packaged in 20-count cedar boxes ($100 to $110 retail). 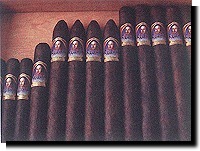 Navigator Cigars are mild to medium-bodied. They are available in three sizes boxed in a 20-stick count ($85-$95), and the Medio Churchill is boxed in 10s available in both Natural and Maduro ($32.50). There are also 5-packs available. The Esteban Carrera blend consists of Nicaraguan and Honduran Sun grown long filler, an Ecuadorian Binder, and either a Nicaraguan Sun Grown Habano wrapper or a Nicaraguan Sun Grown Maduro. They are sold in boxes of 20 at $5.60 to $8.00 retail per stick, depending on size. �The Vigilante Connecticut Shade Cigar is a true vintage, magic cigar with all 1997 and 1998 tobacco,� says Shakespeare. The cigar gets its flavor from tobaccos grown entirely by Miami-based A.S.P. Enterprises, including an Ecuadorian Connecticut Ligero leaf and a Peruvian leaf, �perfect for the beginner smoker yet still appeases the veterans,� notes Shakespeare. Finally, Grande is a medium-bodied line that is attractively priced to appeal to a wide range of smokers. These hefty 60-ring gauge cigars are made in Nicaragua with Central American tobacco and wrapped in a triple-fermented Maduro or a sun-grown Habano Natural leaf. They are available in Torpedo, Robusto, and Toro sizes and presented in clear-top, 10-count cedar boxes ($55 to $60 retail) or 3-count samplers. Each of Shakespeare�s products displayed on the Web site has received high reviews from trade publications. The site also sells accessories such as cutters, humidors, and cedar-lined leather cigar cases. �Selling cigars on the Internet is a free-for-all,� says Shakespeare. �We can promote our brands on a local basis once a partnership is established with a retailer.� Shakespeare acknowledges that retailers who have signed on to the program appreciate having the ability to counteract the threat Internet sales pose to their businesses, so the partnership is a mutually beneficial one. The retailer helps to promote the Shakespeare lines directly with his customers. Shakespeare provides quality product and a Web presence for the retailer as well as manages the Internet transactions. 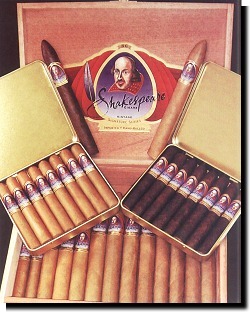 But Shakespeare has other business strategies to help promote cigars. The site www.CigarDictionary.com bills itself as the most comprehensive online source for all kinds of cigar information and has links that includes an alphabetical listing of cigar definitions. The Shakespeare Cigar logo figures prominently on this site. Shoppers can buy cigars, books, and gifts and most of its links connect to other Shakespeare sites. Visitors can also entertain themselves by clicking on the �cigar quotes,� linking up to enjoy pearls of smoking wisdom from such luminaries as Mark Twain, Fidel Castro, George Burns, and Sigmund Freud. On the drawing board is www.MobileCigars.com, a GPS-supported site that will instruct visitors on how to find the nearest cigar retailer no matter where they are.